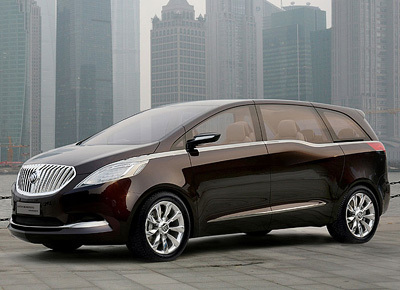 The Buick Business Concept which was unveiled at the 2009 Shanghai Auto Show was a six-seat MPV which was designed and developed by GM's Pan Asia Technical Automotive Center (PATAC) based in China. 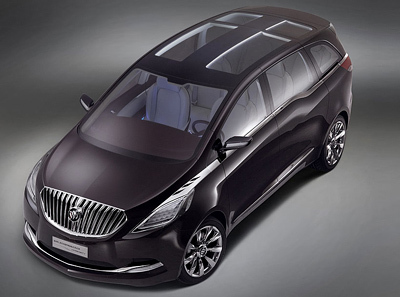 Cao Min, Chief Designer at PATAC, the designers wanted to create a modern global design for Buick, yet at the same time introduce a subtle Chinese styling essence. To achieve this the designers drew some of their inspiration from outside the automotive industry, and looked at classic shapes, art and ancient Chinese relics. Aside from the Chinese influence, the Business Concept takes some of its inspiration from the Buick Riviera concept which was shown at the Shanghai show two years before. The concept also uses influences from other GM products, - namely the Opel Meriva concept - and the two vehicles share a similar stepped side window line which improves visibility for the rear seat passengers. Helping to increase the feeling of space and fill the cabin with light is a glass roof which is split into four windows. 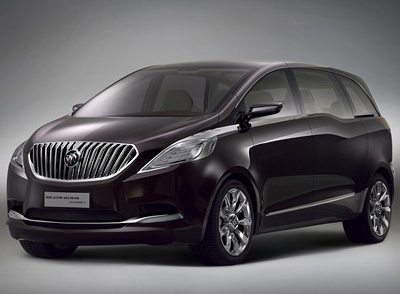 Overall the Buick Business Concept is a well thought out design which manages to be stylish and desirable while still maintaining the versatility and space of an MPV. "This vehicle was inspired by the grace and gesture of great Buicks. PATAC designers have cleverly incorporated other design cues from traditional Chinese art, such as applying a huiwen motif on the turn signals and fog lamps," Cao Min said. The Zitan Purple exterior color is found in rare zitan wood used for sculptures and fine Chinese furniture. 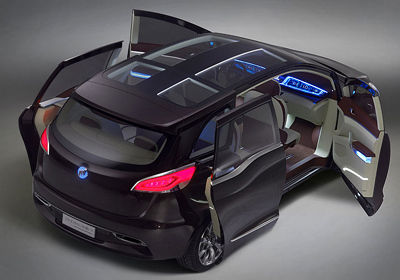 Entry to the Buick Business Concept is through conventional front doors and sliding rear doors. Due to the lack of any B-pillars entry and exit to the interior is completely unhindered. The interior of the Buick Business Concept is trimmed in a contrasting burgundy suede and cream leather which, according to the designers, is intended to represent the earth and wood? Either way the the chosen colors do elicit a feeling of luxury and grandeur fitting for an upmarket MPV. Interior trim and features include a power central console with a deployable tablet for writing or to hold a laptop computer. The console can be moved up and down the two rows of rear seats. The second row of power captains chairs slide on hidden rails and swivel 225 degrees, enabling them to be adjusted to an infinite combination of orientations. 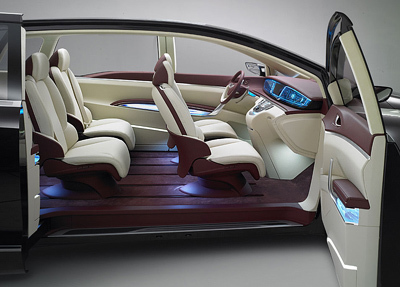 Powering the Buick Business Concept is a next-generation GM Hybrid System which previews the system which will be used in production vehicles sold in China.